Returning from a visit to family on the Central Coast, my husband and I take a leisurely route home, heading north along Highway 1. 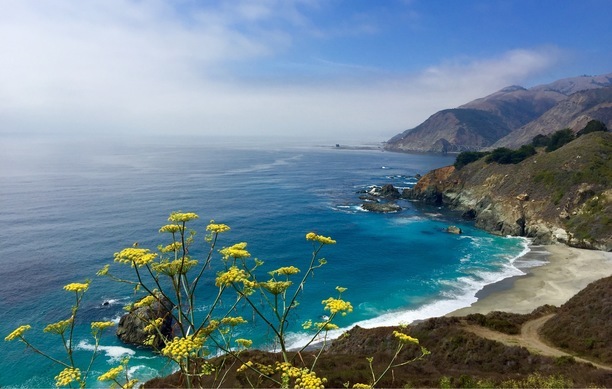 This is the longest and most famous of California’s state roads, and the stretch we cover this day — between San Luis Obispo and Monterey — features some of its most rugged and breathtaking scenery. It’s a thrill ride any time of year, but even more so today with a break in the recent, long stretch of rain. The rolling hills north of San Luis are as green as any in Ireland, their flanks carpeted by wild flowers in riotous bloom. Angus steers gorge on tender spring grass, rays of sun glinting from their black hides as though they’ve ascended to Ranch Valhalla. 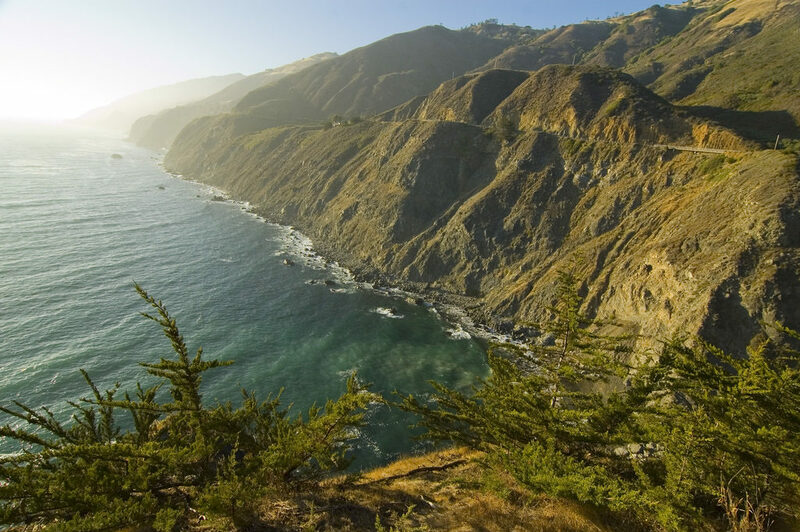 The highway snugs in close to the ocean at Ragged Point, and already we find our reserves of superlatives running dry as we exclaim over the landscape. 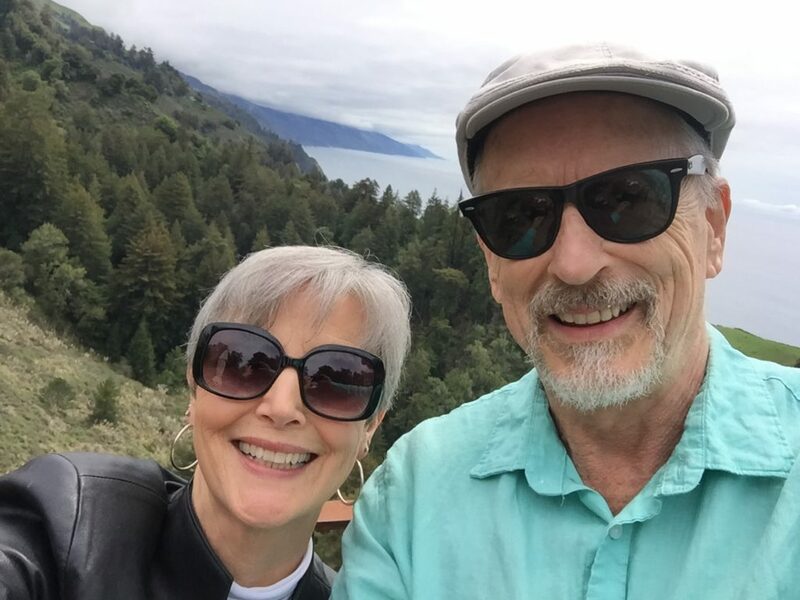 We wind north along the twisting ribbon of road carved into the flanks of mountains whose crags loom above us to our right, while to our left they plunge with dizzying steepness into the Pacific. Seabirds soar over foaming surf, their backs far below us. Jagged, upthrust rocks at the feet of the cliffs are mantled in white where cormorants and gulls have roosted for thousands of years. We stop at one of the many vista points. Here there is only one other car, which rolls away just as we pull in, leaving us with this extraordinary viewpoint all to ourselves. As I step out of the car, the heel of my shoe lands with a squish upon a discarded and fully deployed diaper. Around it, stuck to the pavement, flutter dirty wipes. For a minute I indulge in judgement of my fellow man, or mom, as I wipe my shoe on a patch of weeds. But the beauty of the place is no match for my petty ire. The coastline ripples in dramatic arcs, curving north: the water below is a piebald mix of azure, pewter, and turquoise, and the air, post-diaper, is a bracing brew of wild herbs, sunlight and brine. Movement to our left pulls our attention from the view. A woman peddles a three-seater bicycle up the steep curve of the road, her two young children seated behind her and chatting happily as she chugs away, her slim legs pumping with determination. 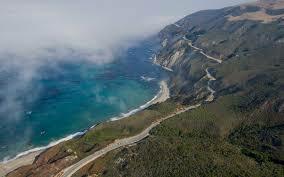 Except for the viewpoint turnouts, there is no shoulder on this twisting stretch of road. We look on as she peddles past us, the cars coming up behind her forming an impatient convoy while she negotiates the next curve. I hope her children will someday appreciate their mother’s sense of adventure, assuming they survive it. It’s time to move on. There is no trash receptacle, but I use one of our heavy-ply dog poop bags to corral the diaper and wipes. My husband is unenthusiastic at the prospect of carrying human waste in our trunkless car, so I leave the bag, carefully tied, in a pocket of weeds where it’s unlikely to either get stepped on or blown down the cliff. And where someone else can find it and muse out loud on the sort of people who leave their dog poop bag in a place like this. Off we go, trailing our carbon footprints behind us. Perhaps a mile further on, I glimpse a large bird — a very large bird — soaring above us, its immense wings ending in long primaries. We are driving through the Los Padres National Forest, where these rare thunderbirds have been slowly repopulating. 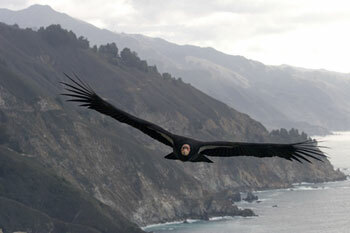 “That’s a California condor,” I tell my husband, as I gaze in awe. 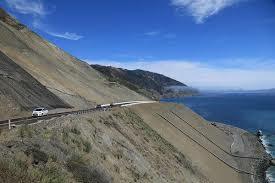 Further on, we come to the landslide that has had a section of Highway 1 closed for nearly eighteen months. In places the road dwindles to a single cleared lane, which we snake along as we behold the aftermath of the entire side of a mountain giving way and slumping oceanward. At one point we are stopped by workmen, where we await the convoy of cars using the same narrow lane to make their way south. Above us on a dizzying slope are other workers who guide earth-moving equipment, appearing toy-sized from down here as they clear loose soil, sending rocks bouncing and leaping downwards to be caught by a temporary debris dam. Watching the work is at first alarming, then hypnotic, until a man waiting behind us climbs out of his pickup and approaches our open window. “Real good idea,” he fumes, “shoving boulders down on top of us.” We get the impression we’re in the middle of conversation that he’s been, up until now, having with himself. “We’re gonna be here for hours!” With that he huffs back to his truck, starts it up, and wrenches it around to head back south. Where there isn’t another cross road that will get him off Highway 1 for many long, twisty miles. Five minutes later, the workmen wave us through, and we drive on, marveling at what audacity it took to build this road to begin with, and what energy and dedication it requires to keep it open. 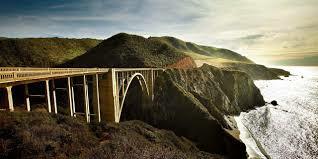 At length we reach the outskirts of Big Sur, where the landscape seems intent on doubling down on its drama and glory. We stop at the famed Nepenthe for lunch, climbing its famed staircase to discover that even on a cool Tuesday afternoon the wait time is an hour and a half. We settle for a snack at the cafe a bit lower down, which still has a patio with a jaw-dropping view. Here I sip a glass of local Chardonnay and consider how much one afternoon can add to one’s inner treasury. The experience is already translating into memory, but I know this: the cliffs still plunge into the ocean; the seabirds still float above the foam; the sun still bursts through the clouds to illumine the hillsides, whether I’m there to see it or not. But I have seen it. When I’m in line behind a shrieking toddler at the grocery store, or on hold with the cable company, or whenever I need to restore my flagging spirits, I can draw from the knowledge that such glory exists, forever unfolding. You live in a beautiful state, Jan. I enjoyed reading the post with the juxtaposition between glorious nature and inglorious intrusions of man (or woman). I think your last paragraph nails it. Maybe the chardonnay helped (it usually helps me). 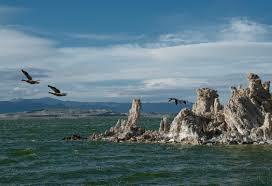 Those heart-stopping vistas and other natural treasures are there, whether we are there to view them or not. The least we can do is to put ourselves in a position to appreciate them, then give feverish thanks for the beauty that exists all around us. I do indeed, Laurie — and sometimes I need to be reminded just how bleeping lucky I am (although Pennsylvania is no slouch when it comes to pretty vistas). Feverish thanks, indeed! We are lucky in seeing such beauty- and lucky to be reminded & awed by it. A day’s drive like that can be more transcendent than a week in Tuscany.